Click on Original image (3.7 MB) to check the image in bigger size. I’m already disappointed. You know why? Because my stupid old laptop will interfere with me watching this presumably beautiful, awesome anime gold. Okay, new wallpaper. Even with the text, it’s still too adorable to resist! I think CLAMP is determined to give everyone toothaches from all the sweetness in this show, fine by me! SOOO ADORABLE! *—-*! I fell in love with the picture definetly! Kobato looks so cute. And Fujimotooo *O* Chiho & Chise lookes adorable too! i can’t wait for october 6th! did i mentioned it? Speaking of wallpaper, i hope we see a clean version of this image pretty soon. OMG IT’S GORGEOUS!!! *_____* …. It’s Seriously perfect! Thank You for Sharing it!!! I haven’t tried the manga yet, but of course I have high expectations for it since it’s clamp! There’s a collection of characters from Chobits, Angelic Layer and the old fortune-telling woman from xxxHolic. Wish has been hinted at being apart of the story, though the manga hasn’t covered much details about that yet. Are yu going to upload new Kobato drops D=? And I squee when I see Chii-chan! These pictures are heightening my expectations of needing this anime to start soon… ;_; oh gawd, i can’t wait~!!! 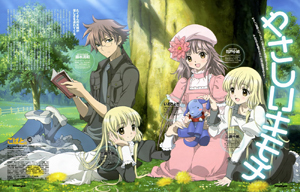 Kobato. pic. is so cute!